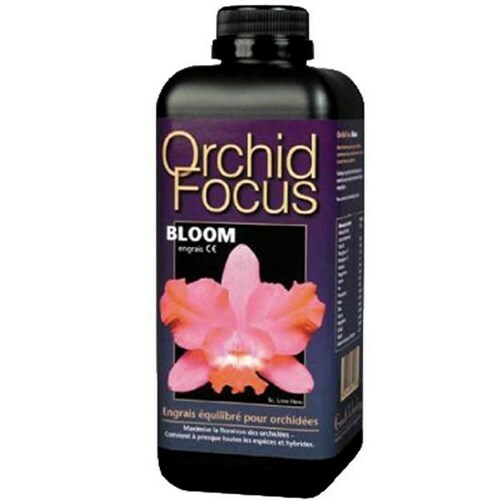 Orchid Focus Bloom is a precise formula for orchids containing all the nutrients needed for a large floral production. Suitable for almost all species and hybrids, it encourages optimal flowering of orchids. Orchid Focus Bloom is made from pure mineral salts and enriched with concentrated acids of organic origin (ammonia-free and urea-free). When bloom is over, change fertilizer for Orchid Focus Grow to encourage further growth. Dosage: Mix 5ml (1 teaspoon) of fertilizer in 2L of water (always clean water like Volvic or rain water). Use every week throughout the flowering period. Rinse roots with clear water once a month to prevent salt formation. Foliar nutrition can be beneficial to orchids. Carefully vaporize the foliage with a less concentrated solution (about 2ml for 2L of water).